George Tucker, bass; Dannie Richmond, drums. Recorded on November 26, 1960. 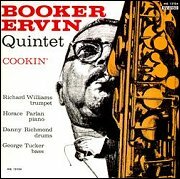 Cookin' reissues tenor saxophonist Booker Ervin's second session as a leader (with a quintet also including trumpeter Richard Williams, pianist Horace Parlan, bassist George Tucker and drummer Dannie Richmond). The session has four Ervin originals plus two standards. The intense tenor, whose sound had roots in early R&B but was open to the influence of the avant-garde, was instantly recognizable by 1960 and this music, although not essential, has many strong solos by Ervin, Williams and Parlan. The reissued Savoy is just about as "straight-ahead" as it comes. There's not much subtlety to the arrangements, which are played with a jumpy regularity, but Ervin and Williams both solo strongly, and the saxophonist's long meditation with rhythm only on "You Don't Know What Love Is" is perhaps the most affecting extended performance on the record.